NEW YORK – Twelve exceedingly rare DC Ashcan comic books from the late 1930s and early 1940s, including Action Funnies Ashcan Edition (DC, 1937/38), estimated at $20,000+ – one of four early placeholders created to help protect what soon would become the most important comic book in history, Action Comics #1 – will be featured in Heritage Auction’s Feb. 22 Vintage Comics & Comic Art Signature® Auction at the Fletcher-Sinclair Mansion (Ukrainian Institute of America), 2 E. 79th St. (at 5th Ave). The provenance of his Colabuono’s collection is unimpeachable: Most of them were purchased directly from former DC Comic President Sol Harrison, which adds a comics history perspective to these rarities. In the early days of comic book publishing, the most common procedure to secure a trademark for a potentially valuable title was to create an Ashcan edition of the proposed comic book – not to be confused with the modern-day term which commonly refers to mass-produced promotional booklets. Companies would simply create the title's logo, affix it to a piece of existing cover art and shoot a Velox of it – a positive photographic print typically used by newspapers as a pre-press proof, accounting for the black and white, rather than color, covers on Ashcans. After that was created, it was trimmed to comic-book size and stapled to the interior of a previously published book, or sometimes just some loose story pages. According to Colabuono, 10 of the books are either unique or the only other copies known to exist are in the DC vault. 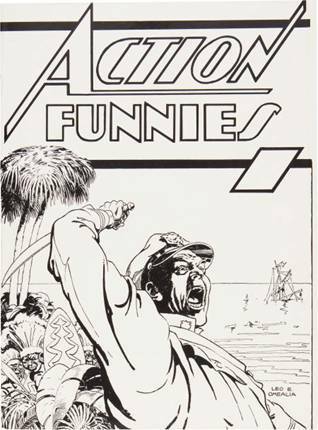 The highlight of the lot is a rare copy of Action Funnies, considered one of the most important ashcans in existence. Only three copies are known to exist. DC war collectors will note that two Big Five war titles are included in the auction. Unique copies of Star-Spangled War Stories (estimate: $6,500+) and All-American Men of War (estimate: $5,500+) should draw close attention, and romance collectors will note that the only DC romance Ashcan known to exist, Girl’s Love Stories (estimate: $5,000+), is included in the auction. The unique copy of Boy Commandos No. 1 (estimate: $8,000+) is also expected to generate great interest, giving collectors of Jack “The King” Kirby a chance to add an Ashcan to their collection.